Every Special Collections library has a number of mysterious boxes that for some reason or another have never been dealt with–gifts with mysterious provenances, duplicate copies, a collection that someone was working on but for some reason never finished, and so on. U.Va. is no exception, though we do pride ourselves on how small that backlog is, and how well-described our cataloged materials are. Soon after starting this job, I was tasked, with my co-hire David Whitesell, to dig into the backlog. For many months now, we have each enjoyed tackling a box or two on a quiet afternoon at the reference desk, or whenever the temptation is too strong and more pressing work is set aside. Much of the pleasure of curatorial work comes from the element of surprise–unexpected gifts, unexpected acquisitions opportunities, unexpected discoveries in the stacks, unexpected researcher projects, and so on. So I was thrilled to find one day recently, mixed with various unremarkable volumes in a box, two early copies of Nathaniel Hawthorne’s The Scarlet Letter. I was even more thrilled to discover that neither came near to duplicating the numerous early copies already in our collection. 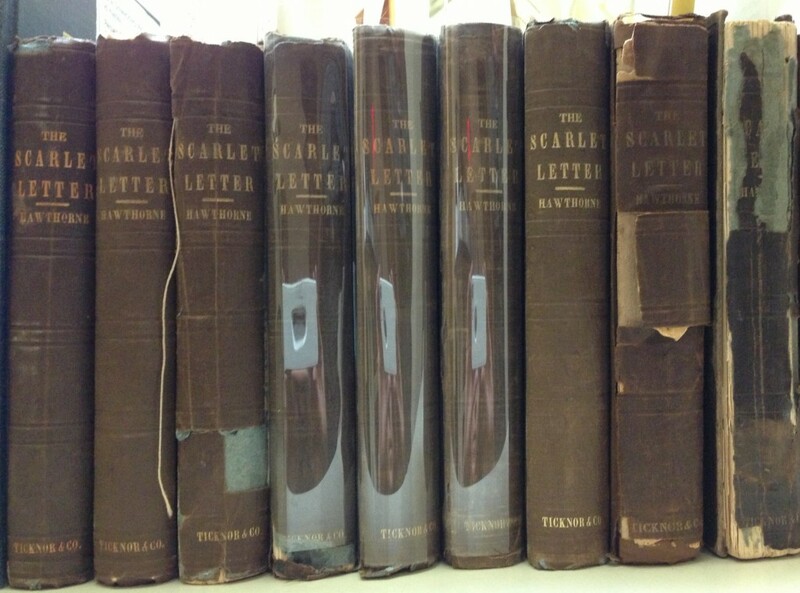 Seven existing Scarlet Letters accompanied by two volumes that will soon join them on our shelves. 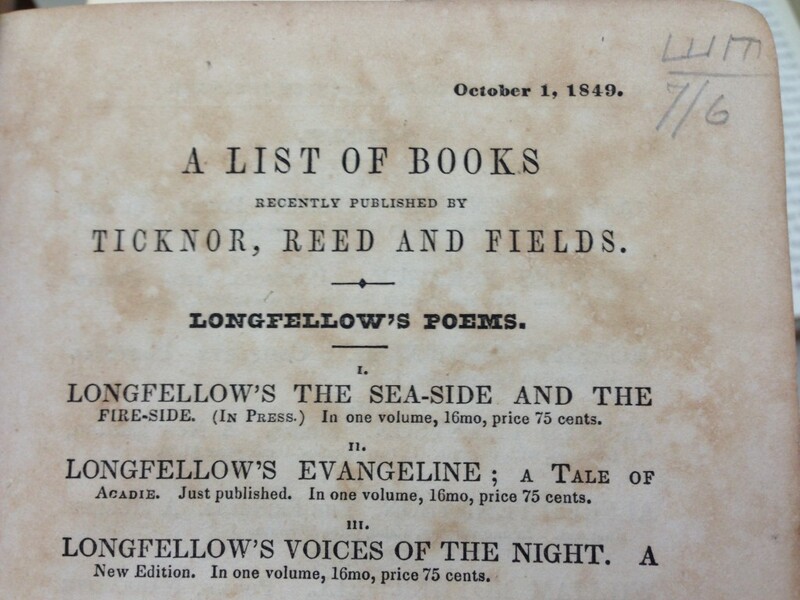 The dull brown covers were a mark of literary prestige, since they were the signature of the highly regarded Boston publishing house of Ticknor, Reed and Fields. Our three cataloged copies of the second edition vary dramatically in condition and paratexts. All but one have bookplates, and all three have advertisements. 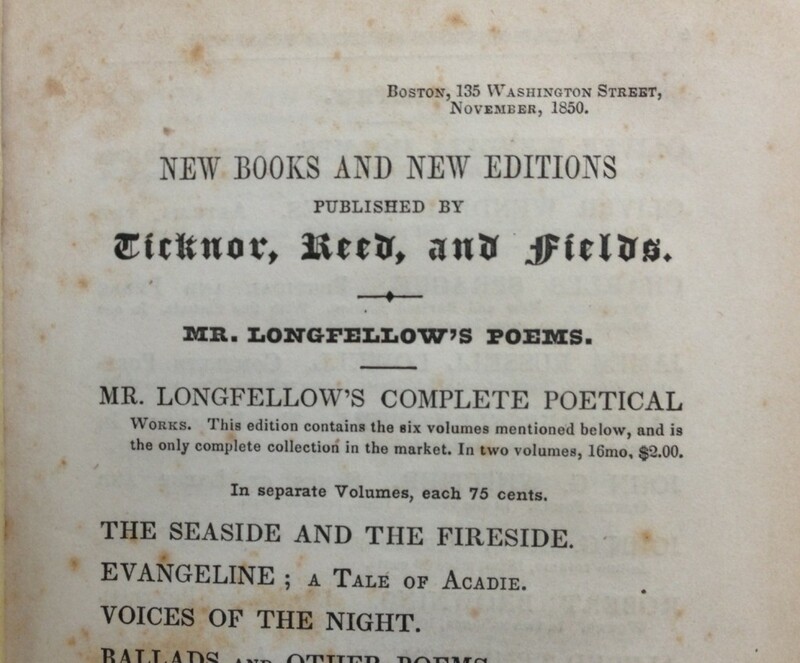 The publishers added to each copy a multi-page advertising insert variously titled “New Books and New Editions” or “A List of Books Recently Published,” all beginning with the publisher’s Longfellow list. The three copies have inserts dated March 1850 and May 1850 (in two copies). Notably, the newly unearthed copy has an advertising insert dated October 1849, which is the earliest insert of any copy of this novel in our collection. Presumably, the insert was lifted from a stack of old leftovers, since the book could not have been bound before the spring of 1850. The images below show a variety of advertisements from the first three editions of the novel, all published in 1850. The other volume found in the backlog is unquestionably unique to our collection, as the only standalone copy of the novel we own with an imprint date of 1854 (a collected works edition we hold is also dated that year). It is printed from the stereotyped plates produced in late 1850 for the third edition. 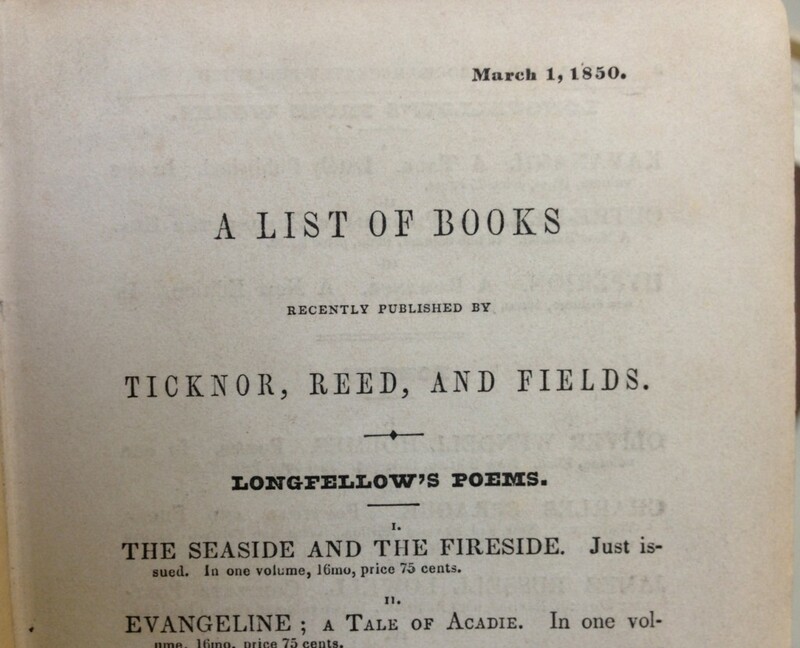 The only 1854 printing, it totaled 500 copies, and brought the total number of copies of the novel’s American standalone editions alone to 10,300. So, Hawthorne fans and bibliographers, we encourage you to come by in a few weeks when these new additions have been cataloged, snugly housed, and added to the shelves alongside their brethren! Our new second edition, on the left, and third edition, 1854 printing, on the right. The yellowed slips in the book show how long these have waited for their moment in the sun (and in Virgo, our online catalog). The origins of these volumes are lost to the sands of time. This entry was posted in Acquisitions and tagged advertisements, Clifton Waller Barrett Library of american Literature, Nathaniel Hawthorne, rare books, Ticknor and Fields by Molly Schwartzburg. Bookmark the permalink.